After receiving his undergraduate education in Business and economics (major) in Cairo University 1954-1958, Mohamed El-Hodiri continued his graduate education in mathematics and economics in Russia (1958-1959) and US 1958-1966 completing Ph.D. in Economics and Mathematical Statistics, MA in Economics, and MA in Mathematics, all from the University of Minnesota. Professor El-Hodiri speaks (classical, contemporary, and all dialects of) Arabic, English, and Russian and is moderately proficient in French and Biblical Hebrew. He is very well informed on Arab History, Islam, and Middle Eastern religious history (esp. EGYPT). He has published over 30 articles in the top journals in economics and mathematics, 15 book reviews, poems in Arabic and English, and 5 books in economics and mathematics. He has chaired 36 PhD dissertation committees at the University of Kansas and Kazakh National University. He has won several awards for excellence in teaching at the graduate and undergraduate levels including. Some of his awards include the Chancellor's Club Distinguished Career Teaching Award for The University of Kansas in 2007, Fulbright Senior Specialist, 2007-Present (American University in Cairo 20012), Mortar Board, 1995, Ned N. Fleming Award Trust Award, University of Kansas, 1994, Golden Key National Honor Society, University of Kansas, 1994, Louise E. Byrd Graduate Educator Award, University of Kansas, 1993, Fulbright Senior Lecturer, 1976-1977 (Oran Algeria), First of Graduating Class, Cairo University, 1958. 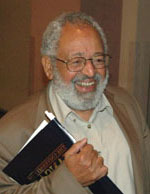 He has been featured in "Who is Who in Economics", and "American Men and Women in the Social Sciences". There have been references to his works in the Palgrave Dictionary of Economics, and Handbook of Mathematical Economics. Between 1994 and 1999 he completed two projects in Russia. During the first financed by USAID grant to Barents group (fiscal reform) Mohamed El-Hodiri was team leader assigned to the Russian Parliament (Duma and Federation Council) where he worked closely and conducted training seminars with the staffs of committees in the budget, tax, economic policy areas. During the second project, Mohamed El-Hodiri was director of the Fiscal Management Training Project on contract by the Russian National Training Foundation to Barents group. The project trained 1200 middle-upper level fiscal management personnel in five centers: Moscow, St Petrsberg, Rustove Na Danu, Nijnii Nov Gorod, and Novo Sibirisk. Participants came from the nearby regions to each of the centers and were trained in the entire budget process from draft to audit. In addition to directing, writing teaching material, teaching and coordinating of publications, Mohamed El-Hodiri was chief country representative for Barents Group LLC in Russia, and President of Barents Group Russia. Copyright © Mohamed El-Hodiri. All rights reserved.